Launch the Old Crown as a venue and raise awareness through the introduction of a corporate identity. 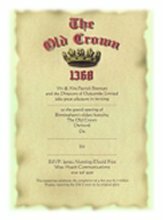 The Old Crown dates back to 1368 and since then it has been home to a bishop, was owned by the Earl of Dudley and King Henry VIII, had been a school, a shop, a manor house and an inn. The Old Crown was closed in 1990 because it was in a state of chronic disrepair. In 1992 local pub operating company, Oakcombe Ltd - owned by the Brennan family - bought the site. 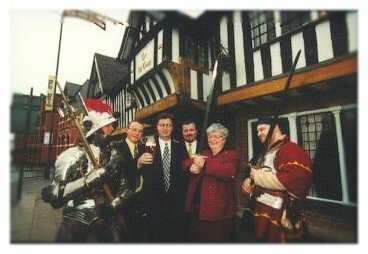 At the end of May 1998, under the guidance of Pat Brennan and his sons Patrick, Gary and Peter, Birmingham's most famous hostelry was restored to its former glory and ready to be re-launched. The Brennans asked M2 to mark their achievement and manage the launch and provide the necessary marketing and PR to effectively raise the profile and establish The Old Crown as a popular venue, without the backing of an advertising budget. M2's strategy combined media relations and creative marketing to position The Old Crown not only as an attraction to which people would travel to visit, but because of the excellence of cuisine and hospitality also make people want to return. Invitations were printed on replica manuscript paper and limited-edition commemorative coins were struck by the Birmingham Mint. All those receiving or purchasing a coin were invited to state their ownership in the "Roll of The Old Crown". This tome, inviting people to state their address, occupation and comments, will become a relic in its own right as a statement of visitors to The Old Crown who were present at the 20th century re-launch; it will be kept in the City of Birmingham Library Archive. The launches reflected the medieval nature of the venue in evenings of knights, music and merriment. Knights in armour fought in The Old Crown courtyard; minstrels serenaded guests while they ate; and a researched, traditional menu was served. The press coverage received was enough to ensure full houses for the first month of opening and beyond. It remains a favourite not only with the locals but also with families, corporate visitors and tourists.